Perfect range training device Military target crosshair projected down-range Adjustable focus Lithium rechargeable battery model 15500 1500mAH Charger included Push button on-off switch. Press to stay on not needed. Ideal for all laser demonstration and presentation needs Free engraving on unit with every order – personalize it! 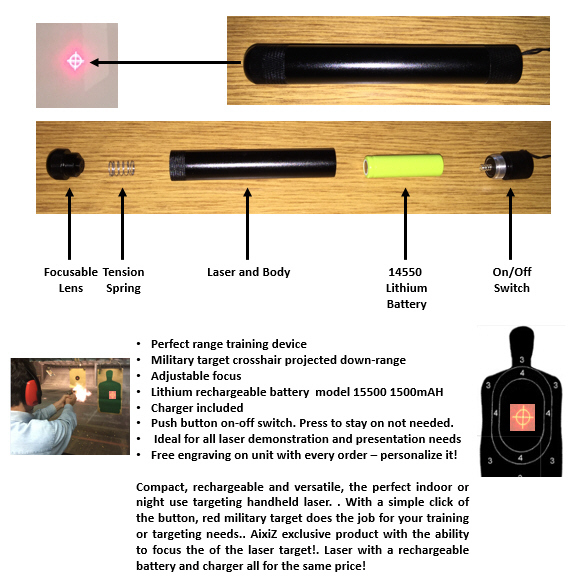 Compact, rechargeable and versatile, the perfect indoor or night use targeting handheld laser. . With a simple click of the button, red military target does the job for your training or targeting needs.. AixiZ exclusive product with the ability to focus the of the laser target!. Laser with a rechargeable battery and charger all for the same price! As with all our products, we ship world-wide without any hassle. This is a 650nm laser-based illumination device which permits a narrow beam or wide area coverage as needed.